On the day he gets married and hangs up his badge, lawman Will Kane is told that a man he sent to prison years before, Frank Miller, is returning on the noon train to exact his revenge. Having initially decided to leave with his new spouse, Will decides he must go back and face Miller. However, when he seeks the help of the townspeople he has protected for so long, they turn their backs on him. It seems Kane may have to face Miller alone, as well as the rest of Miller’s gang, who are waiting for him at the station. Ya’ll know how much I love and adore westerns. They’re awesome and epic and, well, just go read Emma Jane’s opening post for the blogathon (linked above) because it perfectly sums up how I feel about this genre. And High Noon (the original version, not the remake with Tom Skerritt) is one of my favorite westerns ever. In fact, after The Magnificent Seven, I’m not sure if I like High Noon or The Good, The Bad, and The Ugly better. Probably High Noon, though, as it it’s shorter and there are no parts that I find boring (unlike GBU) and it has such a great, thoughtful plot. Plus, the music is just as good as GBU’s, albeit in a different way. In fact, the music was what made me fall in love with High Noon in the first place. That ballad grabbed my heart right from the very beginning of the film and all the different bits and variations of it that play throughout the movie lend a poignant and bittersweet air to the whole thing (something that moves me to tears on more than one occasion). The whole film is beautifully crafted with the ‘real time’ aspect, the music, the arid landscape, and the cast. 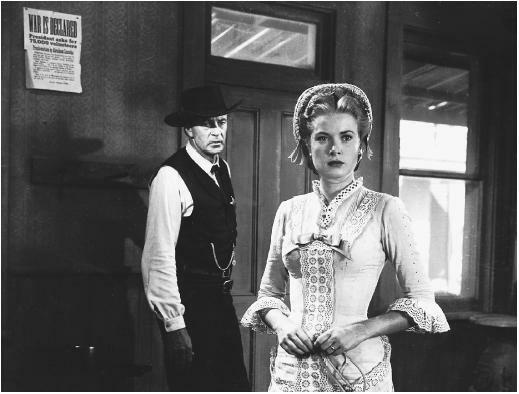 In most of the behind-the-scenes stuff I’ve read about High Noon, it seems that the director was going for a bleak, harsh look (no Technicolor, no gorgeous cinematography) and I think that worked so, so well for the type of movie that High Noon is. Very effective. And the casting! Gary Cooper plays Will Kane, the main character, and he does it amazingly well. The only other movie I’ve seen Gary Cooper in is Friendly Persuasion (where, once again, he is married to a Quaker) and I really enjoy watching him on-screen because of the talent he brings to both roles. I wouldn’t say he’s one of my favorite actors, but he is a good one and his performance in High Noon is easily one of the best I’ve seen in any western. Grace Kelly plays Will’s wife, Amy, and although her character is annoying (not to mention a little bland) she does come through for her husband in the end and I applaud her for that. Everyone else in this film is well cast, well-acted, and interesting (even if everyone else is pretty much a bit part – with the exception of Katy Jurado as Helen Rameríz and Lloyd Bridges as Harvey). Lee Van Cleef makes an appearance as one of the bad guys and Harry Morgan as one of the spineless townspeople. I don’t have enough good to say about this movie. Each element of it comes together to create a powerful, evocative, and unforgettable story of bravery, cowardice, betrayal, and loyalty. (And lots more.) High Noon is a classic, and deservedly so, and if you’ve never watched it before, well…what are you waiting for? welcome to the Alfred Hitchcock Blogathon 2016! It looks very cool in black-and-white . . . Sometimes, actually, I like b&w photography way better than color. They both have their good points, and they’re good for different situations, I guess? Anyway, this looks like a very well-filmed movie. Yes, b&w can be gorgeous – in a lot of ways, I prefer it to color (though, of course, a lot of movies just wouldn’t work in b&w). There was a time when this was one of my favorite westerns. It’s fallen from my favor in the last decade or so, but possibly that’s because I haven’t seen it in that long either. I think the reason Grace Kelly’s character doesn’t work very well is that she’s basically a plot device. Characters who are plot devices often are difficult. I quote this movie quite a bit, still. I’ll say both, “It’ll be a hot time in the old town tonight, eh, Ben?” and “I wouldn’t be surprised.” And I also say, “Quit shoving me, Harv — I’m tired of being shoved!” a lot. And this movie is why I can never quite trust Sheb Wooley’s character on Rawhide. He’s a great guy there, but he’s so stuck in my head as Ben Miller that I can’t shake my mistrust. Isn’t Clint Eastwood in Rawhide, too? Or am I thinking of another western TV show? My own favorite on the show is Gil Favor, the trail boss, played by Eric Fleming. It’s a very fun show, one that I like to talk out loud to as I watch it (very specific sorts of shows and movies make me interact aloud like that). Got loads of great guest stars too — like Rick Jason!! !